It's a pretty stunning depiction of the events of Rick Veitch's "The River" trilogy. 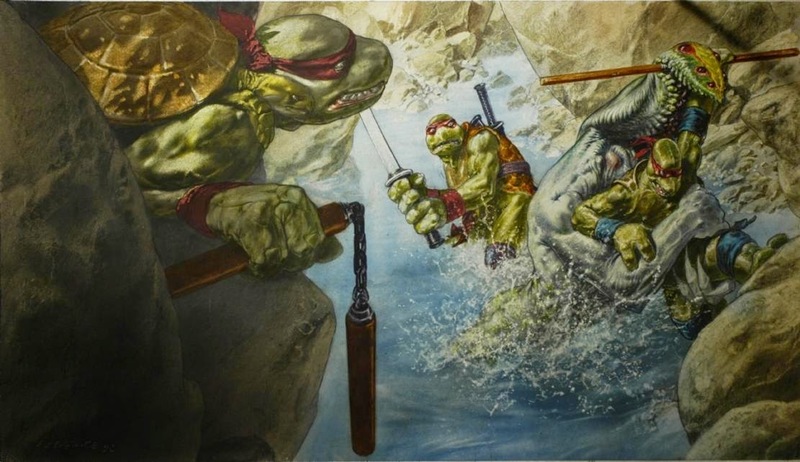 You've got the demutated Raphael perched on Michelagelo's shoulder and a pretty intimidating rendition of Bloodsucker (with some great water effects; all done the old fashioned way) duking it out with Leonardo and Donatello. Special thanks to user "Nortock Diab" of The Technodrome Forums for sharing this piece with me! I have that one tucked away in a folder on my computer somewhere (where I dip in for all my Awesome Turtle Pics). Laird actually posted that one on a Blast From The Past some while back. Evidently, it was an alternate design for the Turtles when he and Eastman were still figuring the characters out. I ought to pick up that Ultimate History book one of these days, though. That expression on Leo gives him a bit of a Will Vinton "claymation" vibe. thanks, mark! And that other Liberatore pic is really cool! I was wondering, what exactly is that on Bloodsucker's shoulder (that is also "biting" into Donatello's shoulder)?